RIO DE JANEIRO (CNS) — Reducing the faith to a worldly ideology, prizing administrative efficiency over missionary zeal, and exalting the role of clergy to the detriment of the laity are some of the major “temptations” undermining evangelization in Latin America, Pope Francis told church leaders from the region. Pope Francis spoke with forceful words on the role of bishops, instructing them to lead without being authoritarian, to adopt “simplicity and austerity of life” and to care for their dioceses without ambitions for more prominent appointments. 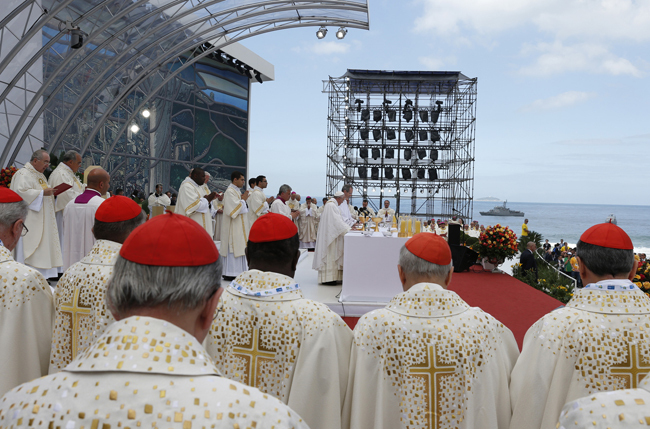 In his four-page speech, Pope Francis spoke with frequent reference to the 2007 CELAM conference in Aparecida, Brazil, where, as Cardinal Jorge Mario Bergoglio, he played a major role in producing the meeting’s final document, which called for a “continental mission” in Latin America and the Caribbean. Noting that “we are lagging somewhat” in pursuing Aparecida’s goals, he identified as a major hindrance a tendency to “interpret the Gospel apart from the Gospel itself and apart from the church,” for instance through the lens of free-market capitalism or Marxism. Pope Francis also warned against a “functionalism” that “reduces the reality of the church to the structure of an NGO (nongovernmental organization),” where “what counts are quantifiable results and statistics,” and efficiency takes precedence over mystery. Remedies for clericalism include increased “opportunities for laypeople to participate in pastoral consultation, organization and planning,” the pope said, as well as an appreciation of traditions of popular piety.